Headboards are a necessity for any bed these days. Historically, their purpose was to protect sleepers from drafts and the cold where the bed was located in a poorly insulated building. These days, the function of headboards are mainly aesthetic and can be complemented by a footboard to balance out the look of the bed. Walk into a bedroom and your eyes will be drawn to the headboard adorning the bed, it becomes the focal point of the whole room. It&rsquo;s therefore important that when you are looking to buy a new headboard, you consider the style of the bed, the material and colour and, of course,your decor. 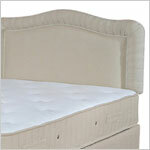 For instance, a headboard with an antique brass finish might not fit in in a small contemporary furnished bedroom. There are so many choices when it comes to deciding and we realise that different people have different tastes. No wonder then that the Sleep Shop carries a vast collection of headboards to fit small single beds up to super king size in a variety of designs and materials.